Ideal as a light lunch or evening supper. This recipe was created by John Hill. In a bowl put your sausage meat, grated onion, bread crumbs, Must Chup, salt and pepper and a whisked egg to bind ingredients. Mix until combined and put in the fridge. Roll out your puff pastry to 5mm thick and cut into rectangles. Then fill with the sausage meat. Egg wash the sides and fold over to make your sausage roll shape. Score top of sausage rolls. Brush the top with egg wash and place on a baking tray with parchment paper. 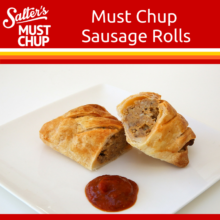 Serve with a nice dollop of Must Chup. Delicious!